Get every power tool you need to turn that to-do list into a to-done list with the Makita Cordless 5-Piece Combo Power Tool Kit. This power tool kit equips you with 5 cordless tools: a variable speed 0.5-inch drill driver with 2 speeds, a variable speed impact driver with 1,460 inch-pounds of max torque, a reciprocal saw with a refined crank mechanism, and a blower for whisking away dirt and dust. On top of that, this set comes with the 4-position flashlight with Xenon bulb and a bag to keep it all together. 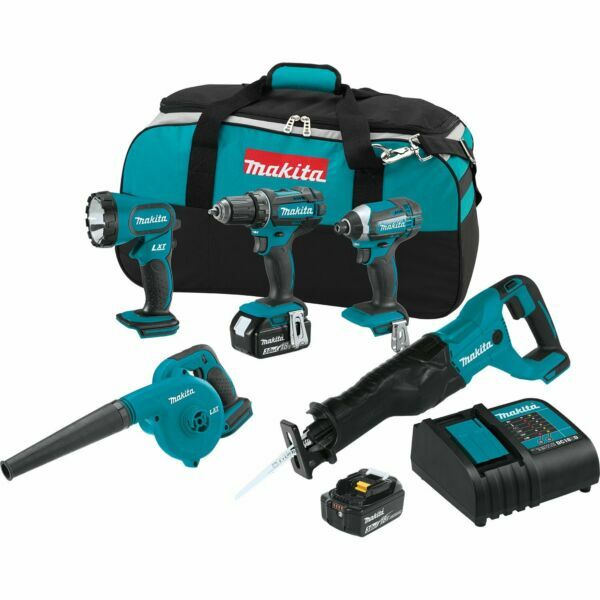 It&apos;s all powered by Makita&apos;s 18-volt LXT Lithium-Ion battery series, and this set comes with 2 3.0Ah LXT batteries and charging station. Get the job faster by having every necessary tool at the ready, thanks to this Makita Cordless 5-Piece Combo Power Tool Kit.